Hugh Gregory McMahon (1870 - 1944) was one of Australia’s most significant contributors to band music culture in the period 1897 to 1944. Known as the ‘Emperor of the Cornet’, he was a fine musician with a virtuosic technique. 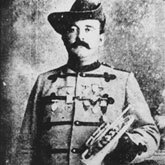 McMahon held the position of Bandmaster with the Hillgrove Brass Band in New South Wales, winning prestigious national competitions such as the Championship of Australasia in Bathurst in 1899. He moved to Western Australia in 1910, where he directed the Perth City Band and the Boulder City Band. The McMahon Collection includes the original manuscripts of McMahon’s opera arrangements, digital copies of these arrangements, and some published music. Ten boxes of printed material, including 60 handwritten scores, either original compositions or arrangements, 87 published scores, CDs of 17 digitised scores, plus a file of 20 related articles. Finding aid of the Manuscripts of Hugh McMahon. Prepared in 2005 (revised July 2009 and January 2010).